The 2017 Kia Sportage EX AWD is a great vehicle for daily driving on paved roads, but can this Korean compact SUV handle the rough dirt roads of rural America? I spent a week driving the new Sportage on my local unpaved roads to see how well – or how badly – the smallest Kia SUV performs on some of the worst public roads in the area. Compact SUVs like the 2017 Kia Sportage (crossovers, if you prefer) have become one of the most popular segments in the American auto industry and at this point, every company doing business in the USA has at least one small SUV in their portfolio. These vehicles are roomier than most sedans in terms of both passenger space and cargo space and they are usually offered with four wheel drive, so they are generally better than many sedans in the snow. The steady rise in popular has led to more competition in the segment, which keeps prices low while keeping the demand for the best mix of power and efficiency high. In short, compact SUVs have become more popular than smaller sedans with many buyers who want more capabilities without compromising too much in efficiency and the Kia Sportage is easily one of the most improved vehicles in the class. In EX AWD form, the Sportage has a nicely loaded interior, a stylish, high tech exterior and an AWD drivetrain which balances power and fuel economy, so for the buyer who is shopping for a small SUV with lots of passenger space, lots of cargo, lots of premium features and a relatively low price – the 2017 Kia Sportage EX AWD is a great option. However, the biggest slight against all of the small SUVs is that they are only good for on-road driving. The vast majority of the vehicles in this segment sit a little lower for easier entry and they have a softer suspension for a smoother ride, both of which can lead to lessened capabilities when you leave the paved roads. Some of these vehicles are no better than a compact sedan on rough roads, so to see how the Sportage drove on rough roads, I spent a week driving the small Kia SUV avoiding paved roads whenever possible. Before getting into how the 2017 Kia Sportage EX AWD performed on rough, rural roads, let’s take a quick look at the interior features and pricing of this compact SUV. While the SX Turbo is the premium trimline for the 2017 Sportage, the EX AWD is the next in line and when you pile on the EX Premium Package and the EX Technology Package, the only thing missing from the top-of-the-line model is the turbocharged engine. My EX AWD test vehicle had heated/cooled/power adjustable leather front seats, an 8-inch touchscreen with navigation linked to a premium Harmon Kardon sound system, a heated steering wheel, a gorgeous panoramic sunroof, and LED interior accent lighting – along with a lengthy list of added-on safety features as part of each of those packages. The touchscreen offers easy access to the sound system, the navigation and various interior settings, but for drivers who don’t like touchscreen technology – the Sportage has a full spread of traditional buttons and knobs under the touchscreen as well as all of the basic sound system controls located on the steering wheel. In addition to all of those features, the 2017 Kia Sportage EX AWD offers an impressive level of passenger space in the front and rear seats, with the rear bench being elevated just enough for the rear-riders to get a better look out the front of the vehicle. The front seats and outboard rear seats will all comfortably fit an average-sized adult with a great amount of leg room and headroom for everyone, but the rear center seat is best reserved for small kids. Also, in addition to spacious seats all around, the rear cargo area is surprisingly big – offering plenty of space for golf bags, hockey bags, a month’s worth of grocery bags or enough luggage for a family of four to spend a week on the road. Best of all, even with all of these standard and optional features, my 2017 Kia Sportage EX AWD had an MSRP of just $32,595 (including destination), so while this small SUV has the features and space of a larger vehicle – it maintains the compact price. Small SUVs like my 2017 Kia Sportage tester are often referred to as “mall crawlers” or some other derogatory term to point out the fact that they are not engineered to performance like the bigger, old school sport utility vehicles in off-road settings. These critics will insist that they should be called crossovers and not SUVs simply because they are not designed to do anything other than drive to and from the office building, soccer practice, the mall or the golf course – and those critics are right. The Kia Sportage was not designed to be an off-road beast and the Korean automaker makes no bones about that, so when testing the 2017 EX AWD model, I didn’t do any real off-roading because the odds are overwhelming that very few (if any) owners will ever do any real off-roading. At the same time, while many 2017 Sportage owners have no intention of doing any off-roading with their compact Kia SUV, a great many of them will have to deal with rough, unpaved roads from time to time. With that in mind, I spent a week driving on the many unpaved local roads with the 2017 Kia Sportage EX AWD to see if this is a vehicle that an owner could drive on a muddy, pothole-riddled road every day. These are the same roads that I drive to test all of my trucks and SUVs, with the best-performing vehicles in this setting being the likes of the Jeep Wrangler or the Ford Raptor, but every small SUV I test spends at least some time on these rough roads. In some cases in the compact SUV segment, a vehicle’s chassis and suspension setup are just too soft for the rough road, making it hard to control the vehicle at any speed above a slow crawl. Other vehicles are controllable, but the deep ruts and potholes batter the passengers badly enough that drivers will find themselves seeking out the nearest paved road simply because the ride is so brutally uncomfortable. On the other hand, the 2017 Kia Sportage EX AWD performed far better than many small SUVs and, frankly, it performed better than I had expected. The dirt roads in my area are groomed from time to time, but when we first moved to this area, I was stunned at how rough these unpaved roads were when they had gone more than a week without being scraped smooth. The holes and ruts are literally deep enough in places for a small sedan to get hung up on the chassis, so when I first took to these rough roads with the 2017 Kia Sportage, I drove gently at first. Rain and freezing temperatures had made these roads particularly choppy and I was a bit concerned that the smooth-riding Sportage would bounce all over the road even at speeds well below the 35mph limit, but within the first mile of creeping along the muddy road, I found that the Sportage suspension setup did a nice job of absorbing the bumps and lumps. This allowed me to gradually increase my driving speed until I reached the speed limit, and at these normal driving speeds, the 2017 Kia Sportage handled nicely. When I came to especially deep ruts, I would slow down as to not bottom out the suspension (or blow a tire), but the simple ripples and potholes in the road were eaten up by the Sportage without much fuss. On a few roads which are groomed more often, there are very few potholes, so the speed limit is 45, and even at those speeds, the Sportage performed well when cruising over the washboards and the washed out ruts. Sometimes, testing a small SUV on my rough local roads consists of me pulling onto one of these roads, driving for a mile or so, turning around and carefully heading back to paved roads – never to step foot (or tire) back in the mud with that particular vehicle. 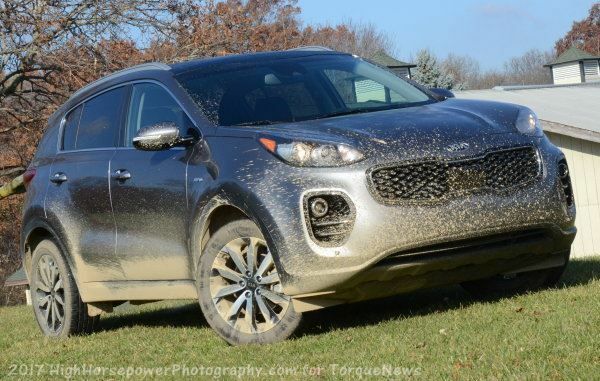 When testing the 2017 Kia Sportage EX AWD, it handled the rough roads well enough that during the course of the week, I didn’t hesitate to take the dirt roads to avoid traffic on the paved roads each day. While driving on the dirt roads one day after a hard rain storm, I came across a section that had been flooded with mud when a nearby creek backed up. The watery mud was deep enough that most cars were turning around to go find a different route, but after gauging the depth and watching a few larger trucks push through, I decided that the Sportage would probably make it to the other side without a problem. Fortunately, I was correct, as fording the runny mud didn’t pose any real challenge, so once traffic had cleared, I turned around and went back into the mud to see how the Sportage would handle driving out of deep mud from a stop. I pulled to what seemed like the deepest portion of the washed out road and came to a complete stop, waiting a second before asking the Kia SUV to carry me to dry land and, once again, the Sportage didn’t break a sweat. Finally, while I didn’t want to risk damaging my 2017 Kia Sportage test vehicle doing any real off-roading, I did head to a friend’s farm where I could experience the compact SUV on much softer footing. The local unpaved roads are rough, but they are groomed regularly enough that in areas where the road hasn’t been flooded, the surface is very hard – even where there are ruts and potholes. That makes the holes and ruts the biggest obstacles for a small 4WD vehicle, as the surface is almost always hard enough for vehicles to get solid traction. That is not the case on the paths leading to the fields at my friend’s farm, as these meager thoroughfares are more commonly traveled by animals that dig up the ground rather than packing it down. As a result, the dirt is fluffy and deep, making it very easy to get a vehicle stuck when trying to climb a hill, but even with the standard all-season tires, I was able to drive all over the property on these narrow paths with deep, loose footing. At times, I would have to get a run to make it up some of the steeper hills without losing traction, but with these paths being worse than any public road in my area, I had to go to unusual measures to find a road that the Sportage couldn’t conquer. Ultimately, if you really need a vehicle that can go anywhere in any conditions, you probably want to consider a vehicle which is a bit more extreme than the Kia Sportage, but for those folks who live in an area where rough, unpaved roads are a part of everyday life – this compact Korean SUV should prove to be a great daily driver year-round. If you are looking for a new compact SUV that can be driven on rough, rural roads every day, the 2017 Kia Sportage EX AWD is an excellent option. The Sportage is fun to drive on paved roads, nicely balancing ride quality, performance and efficiency, but for those of us who have to face rough roads as an unavoidable part of everyday life – this small Kia SUV offers rough road capabilities which are superior to many small SUVs and almost every small or midsized sedan. Should you buy the 2017 Kia Sportage EX AWD if you want to spend your weekends playing at the local ORV park? No…but if you want a compact SUV that rides and drives great on the road, offers a plush interior laying and handles the rough roads as well as any vehicle in this class – the Sportage is a vehicle that you should drive before making your next big purchase.